Tributes have been paid by friends and team-mates of an East Sussex footballer who died after collapsing on the field. Visitors to Ringmer FC on Monday laid flowers on the pitch in memory of Herve King, 27, who collapsed 17 minutes into Saturday's game against Three Bridges. "A fantastic bloke and a great footballer - I will miss you mate," read one of the tributes. Mr King was pronounced dead at the Royal Sussex County Hospital. The cause of his death is not yet known. A flag was flying at half-mast at the club and Tuesday's game against Redhill, in Surrey, has been cancelled. Data analyst Mr King had recently bought a home in Brighton with his girlfriend and was playing his third game in his second stint at Ringmer. 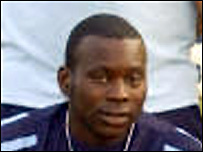 He had previously played at Croydon Athletic in south London, Redhill and Chipstead in Surrey and Burgess Hill in West Sussex. Fellow players and bosses at the club described their shock at his death. "It was horrible - you don't expect it and you don't want anyone else to see that kind of thing happen," said team-mate Andrew Hart. "For it to happen on our doorstep is unreal and shocking," said chairman Richard Soan. Saturday's game against Eastbourne is to go ahead in tribute to Mr King.